Since it was unveiled in 2009, Dutch architect Erick van Egeraat’s The Rock tower has struck a distinctive pose, its angular bulk a head-turning addition to Amsterdam’s southern Zuidas skyline. 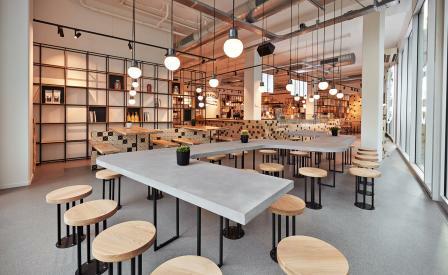 And now, office drones from the neighbourhood’s haul of MNCs and institutions – including VU University Amsterdam – have an equally distinctive watering hole in which to gather for a stylish bite. For the new outpost of local favourite café chain Lebkov & Sons, the Paris-based Studio Akkerhuis has created a concrete space that is styled as a domestic kitchen and living room, its open plan filled with light and demarcated into zones by the strategic placement of modular steel cubes that act as shelves and room dividers, communal tables and long angular benches. The centrepiece of the industrial-lite space is a huge coffee bar and open kitchen whose base is clad in a crumpled creamy black and white crossed tessellation made of wooden panels engraved with light crosses – the effect calls to mind an oversized Issey Miyake Baobao bag - by Milan-based company Wood-Skin.